Noise levels in crew-carrying road vehicles can be high enough to cause concern. In some untrimmed vehicles such as refuse collectors, A-weighted levels have been measured as high as 103 to 105 dB. One local authority operating a fleet of such vehicles commissioned a noise reduction exercise to determine whether it would be reasonably practicable to effect a significant reduction without compromising the vehicle's road worthiness. The primary source of noise came from the engine. 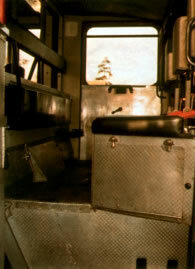 However, the cabin was also subjected to noise from the transmission and hydraulic power pack coming through the relatively lightweight sheet steel floor and toe plates and the rear bulkhead. This secondary noise was reduced by securing a lead/fibreglass laminate sheet to the underside of all floor, toe and bulkhead surfaces. Reverberation was also reduced by lining the roof and all available internal surfaces of the doors and the front and rear bulkheads with an expanded acoustic polyurethane foam faced with a washable porous PVC film. A noise reduction of 4 to 9 dB. 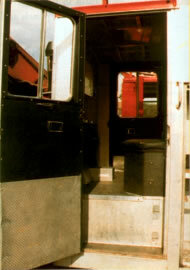 Similar reductions have since been achieved on other types of crewed vehicles such as fire and maintenance tenders.